In 1982, ITT Community Development Corporation (through its subsidiary, Admiral Corporation), announces plans to build a massive beachfront community along five miles of the Atlantic coastline of Flagler County, the Hammock Barrier Island. Their vision for Hammock Dunes includes 6,670 dwelling units, multiple golf courses, other recreation amenities and dedicated conservation areas with an ultimate population of 12,500; equivalent to the population of Flagler County at the time. Initial Development Phase 1984: The Flagler County Commission approves the Development of Regional Impact (DRI) for the Hammock Dunes project. The development covers 2,258 acres, allowing ITT Admiral Corporation to build the 6,670 dwelling units in 42 development clusters. Construction would be on 893 of the platted 2,258 acre parcels A through G. Four major communities are eventually built: Hammock Dunes, Ocean Hammock, Hammock Beach and Yacht Harbor Village. 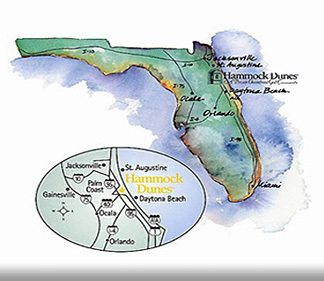 Our community, Hammock Dunes comprises parcels E, F and G, or 1,012 of the 2,258 total acres. 1985: The Governor, and the Florida Cabinet, approve the establishment of the Dunes Community Development District (DCDD), a special purpose local government governed by Chapter 190, Florida Statutes. The establishment of DCDD enables ITT Admiral to issue bonds to finance the Hammock Dunes development infrastructure, including potable water, wastewater management and the Intracoastal Waterway Bridge. 1986: The Governing Board of the St. Johns River Water Management District grants ITT Admiral a 20 year conceptual construction and operation permit for management and storage of surface waters for the Hammock Dunes development. 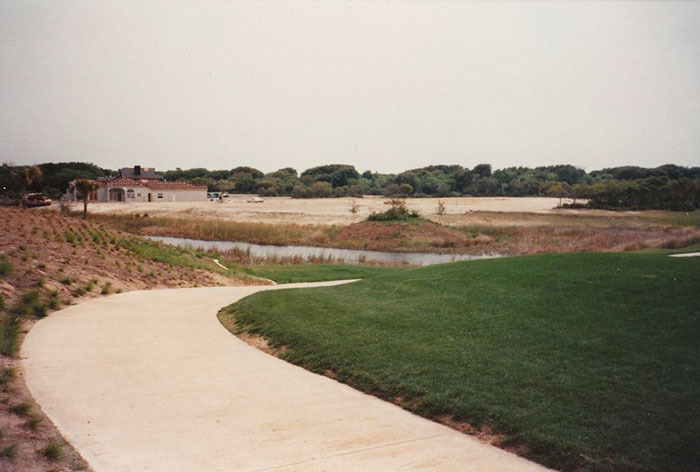 1988: Construction starts on the first Hammock Dunes homes and the Tom Fazio designed Links Golf Course. The Hammock Dunes Bridge is completed, connecting Hammock Dunes to its western neighbor across the Intracoastal Waterway (later to become the City of Palm Coast). 1989: Property sales officially begin. First owners move into their new Hammock Dunes homes, located in the Granada Estates neighborhood. The Links Course opens. 1991: First Hammock Dunes Oceanfront Condominium, La Grande Provence I, opens. The $6 million Hammock Dunes Club House opens and is allocated 12 development units. Residents start moving into the Island Estates neighborhood. Owner occupied units total 58. 1992: First Hammock Dunes Villa, Ville di Capri, opens. Owner occupied units now 142. 1993: The second oceanfront condominium, La Grande Provence II, opens. Owner occupied units equal 186. 1999: ITT Admiral sells portions of the overall development to new investment groups, including HD Associates LP’s $25 million acquisition of the 1,500 unit Hammock Dunes community. HD Associates LP becomes our Developer. Owner occupied units now 433. 2000: HD Associates divests a 91 acre parcel (Yacht Harbor Village), reducing the Hammock Dunes properties from 1,500 to 1,220 units. Owner occupied units at 461. 2003: The Hammock Dunes Club independently opens its $6 million, 680 acre Rees Jones designed Creek Course across the Intracoastal. Portofino oceanfront condominium opens. Owner occupied units now 598. 2004: Playa Del Sur oceanfront lots marketed. HD Associates turns over administration of Hammock Dunes to the Hammock Dunes Owners’ Association (HDOA). Savona oceanfront condominium opens. Owner occupied units equal 643. 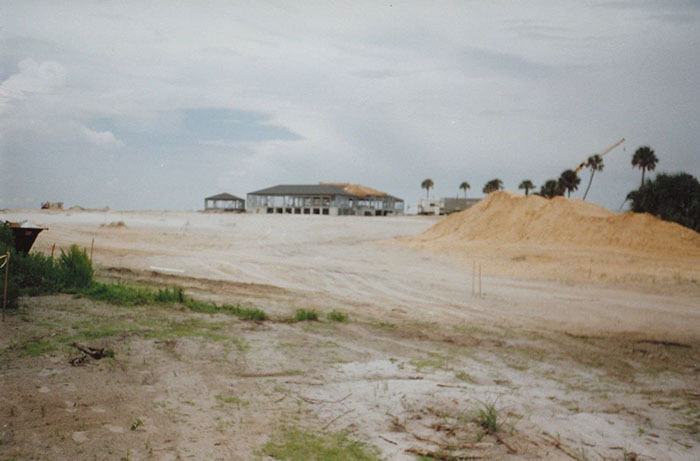 2005: HD Associates turns over Club assets, except unsold memberships/pricing control, to the Hammock Dunes Club. Club House renovation starts, using a combination of Club, HD Associates and WCI funds. Cambria oceanfront condominium and Casa Bella 1 Duneview neighborhood condominiums open. HD Associates sell the 7.78 acre Hammock Dunes commercial tract, adjacent to the Front Gate Sales Office Complex, to Oare Associates LLC. Owner occupied units now 729. 2006: Grand Opening of Expanded Club House. Tuscany oceanfront condominium and Casa Bella II Duneview neighborhood condominiums open. Le Jardin oceanfront condominium construction starts. Owner occupied units at 833. 2007: Peak of real estate market, owner occupied units equal 870. 2008: WCI defers construction of their two remaining condominium units until the economy improves. 2009: Le Jardin condominium opens. The HD Club awarded “Platinum Club of America” status. Owner occupied units now 892. 2010: HD Associates announces plans to liquidate their remaining Hammock Dunes assets and closes their Front Gate Sales Center. Owner occupied units at 894. 2011: The Hammock Dunes Club acquires the remaining unsold memberships and control of pricing from HD Associates. The HDOA Board of Administrators initiates negotiations with HD Associates to purchase their “Remaining Developer Assets”. Flagler County signs the Essentially Build-Out Agreement (EBA) with ITT, Admiral Corporation and the Florida Department of Economic Development, closing out the DRI. The EBA releases all Developers from any DRI obligations related to future development towards the Flagler County and Palm Coast governments. The EBA also relieves the DCDD from building a second two-lane span to the Hammock Dunes Bridge, thus ensuring a low traffic density, maximum 2-lane “residential” approach to Hammock Dunes and the other DCDD supported Hammock communities. Owner occupied units at 904. 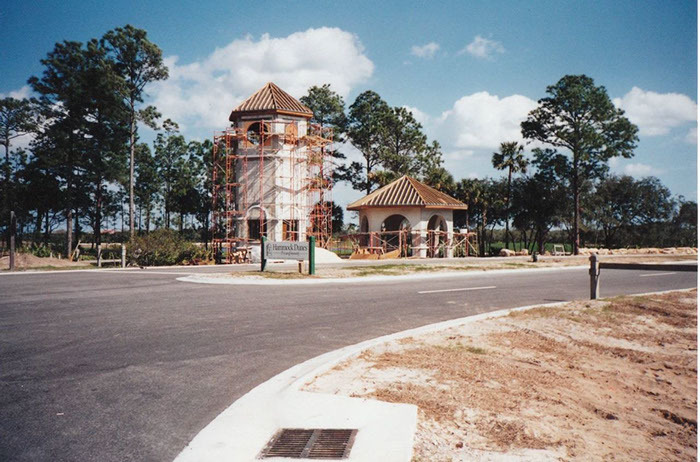 2013: The Hammock Dunes Owners’ Association (HDOA) acquires the Declarant Rights and the 2.46 acre Front Gate Sales Office Complex from HD Associates, assuming the Developer role for the future prosperity of Hammock Dunes. The HD Club awarded “Distinguished Emerald Club of the World” status. Club hosts its first National Pro Am Golf tournament. 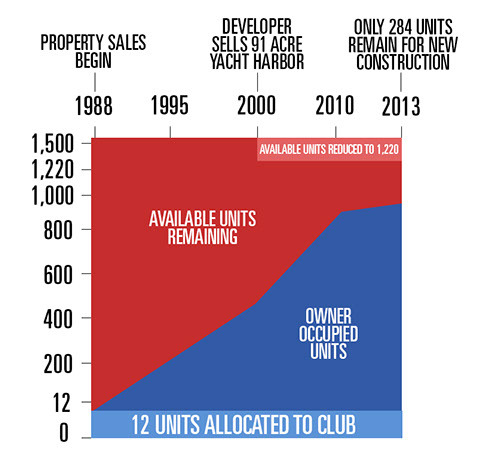 Of the total 1,220 Hammock Dunes property units, owner occupied units now equal 924. 2016: On October 7, the eye of Hurricane Matthew, now rated as one of the ten most destructive hurricanes ever, passes approximately 30 miles off the coast of Hammock Dunes. Thanks to the design and construction of the engineered dune and raised berm along Jungle Hut Road by ITT Corporation and HDOA's pre-Matthew maintenance investments in its beach and dunes (including sand fencing, planting, and fertilization), these dunes, even though they sustained significant damage, protected the Hammock Dunes community from the Matthew storm-surge flooding experienced by neighboring communities along the coast. 2017: In order to protect the community for the 2017 hurricane season, the HDOA completes an aggressive first phase dune restoration project at the end of April to rebuild and replant its dunes that were damaged by Hurricane Matthew in October 2016. This project was the first completed in the county and has strengthened the dunes for the next nine months until a full restoration can be planned, financed and completed during the 2017/2018 winter season, when sea turtles are not nesting. In 2018, Flagler County completed this second phase of sand replacement to further fortify our dunes. FEMA partial reimbursement is being sought for all reparations, and efforts are being made for a long-term plan to keep the beach and dunes at design strength in conjunction with state government. It is very important that all Hammock Dunes property owners and prospective purchasers for residences in the community have the confidence that our community is well designed and being maintained to retain a low risk of flooding during hurricanes, as was the case during Matthew. for a bird's eye drone video of the contractor in action.